Home » Page Type » Blog » Is a Brain Necessary for Intelligence? Is a Brain Necessary for Intelligence? The slime mold Physarum polycephalum (diameter: around 10 centimeters), made up of a single cell, was here cultivated in the laboratory on agar gel. It’s a fair assumption. If we’re looking for intelligent behavior in an animal, it had better have a brain, or at the very least a neural system of some kind. Otherwise, how can learning take place? It takes place via experience, trial, and error, the results of which are stored in our neural systems. Animals with larger brains will tend to be more intelligent. At least that’s the theory. But then, what do we do about slime molds? We’ve all probably seen them without knowing their name. They resemble spongy yellow masses that cling to rotting wood. It’s been known for a while that some slime molds are good at solving maze problems. (See video below). They can also reproduce the structure of a modern city like Tokyo. Is this intelligent behavior, at least in the way we understand it? Slime molds certainly do not have any brain or nervous system. Their behaviour has until now been explained in terms of their ability to develop sophisticated networks by trial and error, something that does not require any forethought or learning. But what if they can learn? A recent experiment conducted by a team from Centre de Recherches sur la Cognition Animale (CNRS/Université Toulouse with the slime mold Physarum polycephalum, shows that the organism is capable of a primitive mode of learning, called behavioural habituation. The results were published in Proceedings of the Royal Society. 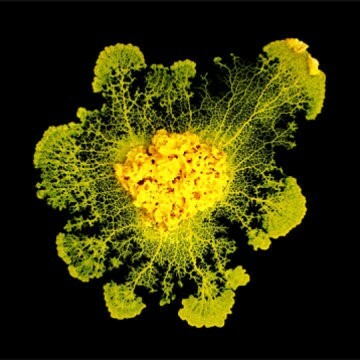 The slime mold was presented with a harmless but bitter barrier, caffeine or quinine, placed on the road to some food. After some time, the mold learned that the barrier was harmless and began to behave similarly to a control group. Some days later, the mold appeared to forget its learned behavior and regained its initial aversion to the coffee. The authors’ comment, In living organisms with nervous systems, behavioural habituation is the result of an alteration in neurons and synapses. How does the slime mold do it? Clearly, this rudimentary form of intelligence arises despite the organism’s lack of a nervous system. What about other life forms, such as plants and trees? Or fungi which have networks that vastly exceed those of fungi? Are they intelligent? Can they think? Is it meaningful to talk about them being conscious? The recent experiments with slime molds suggest that the questions are far from trivial.